It was a bad day for both the Carolina Panthers and the Seattle Seahawks. Both had missed plenty of opportunities, made terrible decisions and just did not play well. In the final minute, the Seattle Seahawks made the plays they needed to make. Russell Wilson threw a 23-yard touchdown with only 47 seconds left and Seattle came away with a 13-9 victory over the Panthers. Cam Newton’s bad day was evidence enough that Carolina had yet another bad game. Newton only completed 12 of his 22 passes for 171 yards and no touchdowns. He had two bad turnovers, an interception when he should have taken a sack and a fumble in the red zone. He was sacked three times, twice on the final drive of the game. Carolina was finally able to get their run game going, as they ran for 114 yards on 31 carries. Running back Jonathan Stewart led the team with 79 yards on 16 carries. Meanwhile, the Carolina defense did a good job shutting down the Seattle offense, allowing Marshawn Lynch only 62 rushing yards on 14 carries. In a game where Carolina was able to finally run the ball and play solid defense, you would think they would be able to come away with a win. However, missed opportunities did them in, along with poor play calling. They were able to drive into the red zone on their first three possessions of the game, only to come away with 6 points. On their first two drives, they were forced to kick field goals, and on the third, Newton fumbled. On their final drive, Newton was sacked twice and on 4th and 25 around their own five yard line, offensive coordinator Mike Shula, known for his poor play calling, decided for the offense to run a screen pass. It fell incomplete. Tight end Greg Olsen, usually Carolina’s most consistent and reliable player, only had one reception. 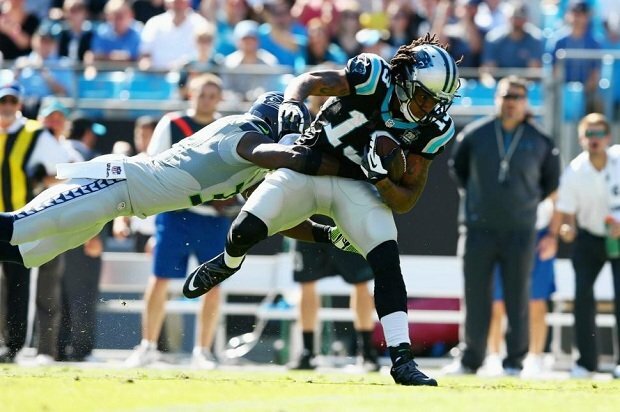 Rookie wide receiver Kelvin Benjamin led the team with four receptions and 94 receiving yards. Despite the win, Seattle had many missed opportunities. Carolina fumbled four times and Seattle was only able to recover one of them. They dropped quite a few sure interceptions as well, and Russell Wilson threw one in the end zone at the end of the first half. Miscues were the name of the game for both teams. The loss leaves the Panthers at 3-4-1, but still in first place of the weakest division of the NFL, the NFC South. No team in that division is at .500 in winning percentage. They will be at home against their divisional rivals, the New Orleans Saints, this Thursday. Seattle goes to 4-3 and is tied for second in the NFC West with the San Francisco 49ers. They will return home to face the Oakland Raiders next Sunday.